After years of lectures, exams and assignments a graduate can finally relax with a degree in hand, ready to take on the working world, right? Wrong! The stress of finding and securing a graduate job is one students hear about before our university studies have even begun.Participation in community service, involvement in an array of extra-curricular activities, part-time work, internships, a period of study abroad, a specified GPA, and previous interview experience are among the growing list of experiences graduates are desperately trying to add to their resumes – just to secure a graduate-role interview. Why have these expectations developed so greatly from the generation before us? And are internships just another tool for recruiters to distinguish qualified applicants? Can they genuinely provide value to an employer or future employee? Fifty four percent of Millennials have university degrees, compared only 26 percent of Baby Boomers, Millennials spend an average of 3.4 years in a job, Baby Boomers spend an average of 5.8 years in a role. Ninety one percent of Millennials expect to stay in a job for less than 3 years. Priorities and attitudes towards work have significantly changed between generations. Once upon a time, individuals would stick with a role despite issues they may have had with it, while today, organisations are working hard to attract and keep employees, having to sell their organisation as a workplace of choice. We are no longer as willing to gratefully accept a minor role in a small company and work hard to prove our value and slowly accept promotions. We are increasingly aiming for graduate jobs in the leading firms, agencies and organisations in the market, with a matching salary. As these leading companies are flooded with identical resumes and transcripts, they have reacted by giving roles to applicants with unique experiences or distinguished efforts throughout their studies, which slowly morph into expectations. 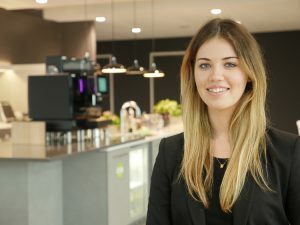 Along with the large cohort of students studying a Commerce degree in Sydney, I assumed that at some point in my degree I would seek out an internship, not only to improve my chances of employment, but to try to gain an understanding of my studies in practice, and whether my interests aligned with a practical role. I did not expect a casual conversation at a social event to lead to an opportunity to start an internship in a top accounting firm in Australia, KPMG. Of course, I grabbed the opportunity with both hands, not realising just how valuable it was. While some of the experiences filling student’s resumes’ may just be noise surrounding their skills, an internship is truly one of the most valuable experiences a student can embark upon. Through my on-going work experience with KPMG I have had the honour of working with, and learning from, some of the most intelligent, personable, driven and inspiring people I am likely to ever meet. I had the opportunity to observe a strong work culture and the communication and relationships which typify it, and to watch professionals in their elements and to try and replicate and learn from them. I gained feedback, advice and mentoring which extended far beyond industry-knowledge. Most significantly, I developed confidence in my ability to challenge myself and struggle or even fail, to ask for help from people I would ordinarily be too intimidated to talk to, and to build professional relationships. If this seems like a cliché, then it is for a reason. I would strongly urge any student to push their textbooks to one side and find an internship as soon as possible, because you’ll gain more than you ever could from a classroom. You’ll gain the opportunity to test out work with a safety net, to discover that you actually hate the practical application of your favourite subject, or love the practical work involved in your least favourite, or that you’re in entirely the wrong industry. So talk to as many people as you can: lecturers, friends’ parents, parents’ friends, and if you get the opportunity, work as hard and learn as much as you can. At the very least, you can pop it on your resume. To give some context, I am an Intern from the Chicago office, currently on a global transfer to Melbourne. I thought I could share some perspectives from my experience. In the United States, obtaining an internship within your final years of college is no longer an action to set you apart from your classmates. Instead, it has evolved into a rite of passage that every junior or senior needs to embark on in order to show not only their future employers, but also family members, friends, and professors that they have the capability to pursue a career with their education and they have the necessary qualifications to do so. It is no longer a question of if an student at my university can obtain an internship, it’s a matter of a where they can see themselves making the most impact, where they can see themselves working full-time. It should come as no surprise that the answer for me was KPMG, so I signed my internship offer for the Chicago office in May 2015. Now, a year and two months later, I find myself part of a Global Internship Program 9,000 miles away from home in the Melbourne, Australia office. I found that my experience has been very similar to yours, Jemma. I have learned a lot. I’ve learned that infrastructure is constantly growing and improving in Australia, and KPMG is at the forefront of implementing those changes. I’ve learned that I am no longer an intern, but a “vacationer” that has become the newest member of a small but hardworking group. I’ve learned that focusing on one area at a time isn’t enough, and each member of my group has their hands full with issues associated with energy, transportation, education, and whichever else they feel they can make a tangible impact. I’ve learned that coffee is in fact a lifestyle. I’ve learned that even though I’ve called Chicago home for the past 21 years of my life, I can leave home and find happiness doing so. Interning at KPMG, both in Chicago and in Melbourne, has taught me that anywhere in the world KPMG breeds a strong work ethic and encourages personal growth. It has taught me that after my final year of college, my Internship will help to guide me into a working lifestyle, whether in Chicago or elsewhere in the world. I completely agree with you Jemma; lucky for me, this turned out to me much more than a resume-filler. Hi Lucy, thank you so much for your comment! I am so glad to hear you have also had such a positive experience with KPMG it was so wonderful reading about your transition from Chicago to Melbourne and your story has inspired me to look further in to that opportunity! I wish you all the best for your future endeavours.